The Hi-Temp Shut-Off Module from Waters Equipment Co. protects steam analysis instrumentation from damage caused by high-temperature samples in the power plant/boiler sections of pulp and paper mills. The Hi-Temp Shut-Off Module from Waters Equipment Co. protects steam analysis instrumentation from damage caused by high-temperature samples in the power plant. The Hi-Temp Shut-Off Module, an alarm device installed between the sample conditioner and an instrument, is particularly effective where cooling water failure is possible. The device prevents electrode burnout, even if the supply of cooling water to the sample cooler has been shut off. The Hi-Temp Shut-Off Module detects high-temperature samples and shuts off the sample flow if the temperature exceeds a preset limit. It is typically used on boiler samples where the operator of the boiler is measuring certain chemical properties of the water and steam inside the boiler. 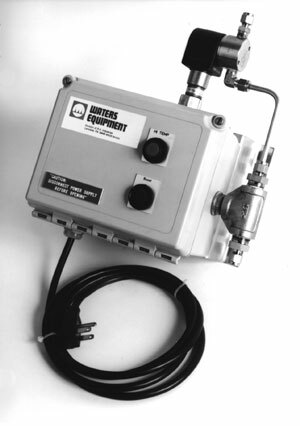 The module enclosure contains alarms, both local and remote, and a manual reset, requiring operator attention. The Hi-Temp Shut-Off Module is particularly useful for instrument applications where a loss in coolant or surges in sample flow rates can cause the sample temperature to suddenly rise. The compact (12" x 11" x 7") module's 316 stainless steel wetted parts prevents contamination of the sample stream. It also features a water-proof and corrosion-proof NEMA 4X enclosure. The module is lightweight (less than 10 lbs. ), easy to install and includes a stainless steel wall mounting bracket. Waters Equipment Co., Po Box 576, Lansdale, PA 19446. Tel: 215-699-8700; Fax: 215-699-8795.